After becoming the world’s most expensive player following his record breaking move to Real Madrid, it’s not hard to understand why the media spotlight appears to be permanently fixed above Gareth Bale’s head. The welsh winger, who made the switch from Tottenham to Madrid in the summer of 2013, has embraced life in the Spanish capital and despite a rocky start that was plagued with injuries and language barriers problems, Bale has impressed with some breathtaking performances. Two in particular set him apart from everyone else, including his pragmatic teammate and World player of the Year, Cristiano Ronaldo. With the Portuguese superstar confined to the stands due to injury, it was to Bale that Madrid turned for inspiration during their Copa del Rey final against Barcelona last year. And he didn’t fail to impress scoring a wonder goal that is now one of the most viewed goals of all time. With only minutes left in the game, Bale picked up the ball on the left wing just inside his own half, nudged it past Barca right back Marc Barta and set off after it. With his path blocked he was forced to run into the manager’s technical area which handed Barta a five yard head start. It mattered little for Bale who outpaced Barta, collected the ball and coolly slotted past Pinto in the Barca goal to hand Real the trophy. A month later, he would be on hand again late in the game to head Real into the lead during a hard fought Champions League final against rivals Atletico Madrid. It would be the turning point in the game. With Atletico now broken, Real surged into a 4-1 lead and ultimately picked up their 10th Champions League title. Bale had secured legendary status and appeared to be loved by both the fans and the media. The love hate relationship that exists between the press and players like Bale is born out of necessity with both parties with much to gain. But whilst Bale remains impartial to the local Spanish press, preferring to keep them at arm’s length by living a quieter, event free life in order to protect both his image and his family, keeping them onside is equally as important. After all they tend to be two faced and have the ability to pander your name to the masses which can make life more difficult. 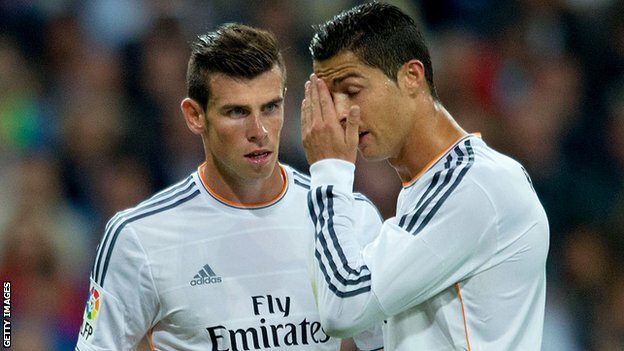 Bale is experiencing this first hand and as a result is suffering the consequences. Once loved and adored by the Spanish newspapers Marca and AS, who waxed lyrically about his match winning performances last season as Madrid marched to domestic and European trophies, they have started to turn on him slating his every move and criticizing his performances on the pitch for Madrid this season. 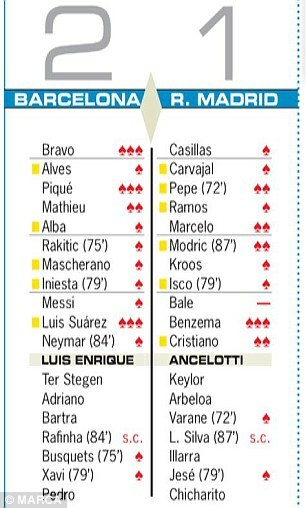 Whilst critical of the entire Real Madrid team following their 2-1 defeat to Barcelona on Sunday, Marca pinpointed Bale as the main culprit and even refused to rate him in their review of the game the next day. AS did decide to rate him however gave him a 4.5 out of 10, indicating that he was by far the worst performer for Real on the night. Whilst Bale freely admits to a dip in form in the last few weeks, the stats still showcase that he is having a good season having scored 14 times in the league with countless assists for his teammates. But with the boos now ringing out from the Madrid faithful in the stands due to what they see as a series of under performances since the turn of the year, the focus of that anger is now starting to be concentrated on the teams more talented individuals. Bale in particular has received some harsh treatment from the Real fans, fuelled by the negativity being spewed out by the Spanish press. For the generally laid back Bale, the pressure is starting to show on the 25 year old. Two weeks ago, Bale ended his 829 minute goal drought with a double against Levante. He celebrated by covering his ears, indicating acknowledgement of the boos aimed at him that had been ringing out for several weeks before running to the corner flag and kicking it hard out of pure frustration. The negativity is affecting Bale and the way that he plays with the skinny nervous welsh boy that used to exist now reappearing. To make matters worse, Bale’s car was attacked by some fans following the defeat to Barcelona on Sunday. He was not the only player but Bale must now be considering his own safety and that of his family. With the season nearing its end, it could be a summer of transition for Bale who may decide to quit La Liga in favour of a move back to the Premiership and an escape from the boo boys. Real will not want to see him depart, given that they view him as the long term successor to Ronaldo who at 30 years old and with a growing list of injuries will soon run out of steam. If Bale does stay, he will need to win over the fans and more importantly his toughest critics, the press. They once adored him so it is possible that Bale can charm them into loving him once more.